Fashion items and obedience to Christ belong to two different realms. The former is not a sin, the latter is what Christ called us into. The church deals less with the primary call of Christ these days. It seems as if the demand of discipleship is old-schoolish. I think fashion items will never take the place of obedience to the call of Christ and that obedience and the practice of the gospel will commend Christ in us more to the world as it did in Antioch. The dignity of the gospel is greater than any human addition of glamour to it as it has pleased God to save only through the foolishness of preaching. May we remember to deny ourselves in obedience to Him daily. Nor any divination against Israel. And of Israel, Oh, what God has done! 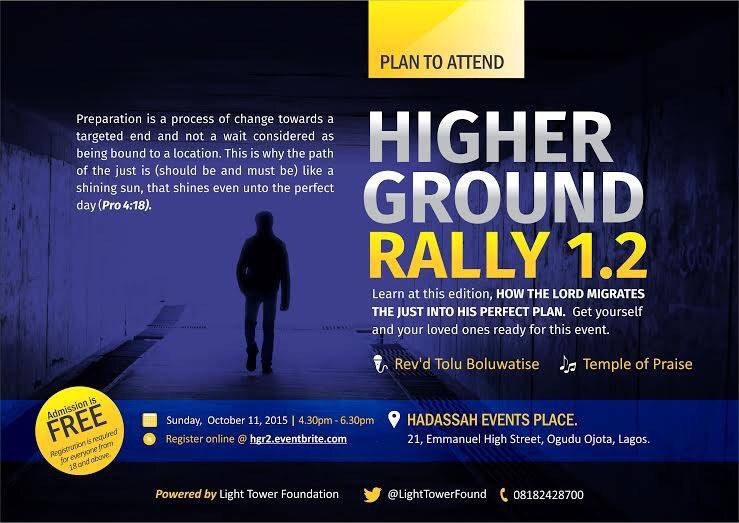 On Sunday, 18th October 2015, Rev. Isaac Boluwatise shared from the scripture to upset the ideology (popular especially in the African context) about curses. He showed that a man’s life is ruled by his ideological leaning, i.e. what he thinks and what he believes, which affect how he lives and does things. A personal ideology not checked with scriptural lens can ensnare a person’s progress towards the zenith of God’s plan. He shared that even after salvation, Christians are still prone to think in regional terms. The instantaneous change at salvation did not produce a drastic overhaul in the mind. The mind is to be transformed continually towards the image of Christ. Such transformation, causes us to know that while our earthly regional affiliations stands, as new creation 2Cor. 5:17, belonging to a new commonwealth, 1 Pet 2:9, Phil 3:20, our affiliation to the kingdom of God becomes primary. He established that the general way of thinking in Africa, which uses the incurable religious disposition in humanity, appreciates the supernatural but wrongly magnifies the devil and his prowess more than God, emphasising the efficacy of curses more than of blessings because of the experiences from the past. Rev. Bolu in his teaching did not deny the operations of the devil and the reality of curses; he however insisted that the blessing is superior to the curse. 1. The promises of God stand in spite of the troubles from the past or around in the present. A person blessed of God cannot be cursed, your future pronounced by God cannot be denounced by the devil. Numbers 23:8. 2. It is time for you to take what belongs to you and that everything standing in your way are giving way for you. God, he said, is positioning you to the frustration of the enemy. The enemy is out on a mission to devastate seeing you are now thinking less of the past. He doesn’t give up on his mission. Pastor established the truth that every believer is blessed of God and they should never doubt this and should know that as the journey gets closer to what God has for you, the devil’s strategy changes for the worse while the blessing of God stands sure. 3. You need to understand the significance of blessings and curses: he explained that Both are empowerment (He defined blessing as empowerment by God for you to be all He has declared about you and curse as empowerment by the devil for someone not to be all he was declared to be,) set before you: as your choice and thought will determine which of them operates in your life) and released by words (In diabolical operations they use words, incantations to express sorcery and cast spells. God also declares blessings via the spoken word. His blessings are His spell (God’s spell is the root for Gospel in English) cast upon lives and situations for prosperity). He encouraged everyone to invoke divine blessings: (1). By refuting every mouth that speaks against personal welfare since God did not design such scheme for His people. (2). By believing that the end is blessed despite the attempts of the devil. (3) By rising up like a lion that will not rest until victory has been celebrated; and (4). By pronouncing the blessings since God has previously released them. He rounded up with the declaration that we are blessed beyond the curse, encouraging everyone to consciously, intentionally walk in the provisions of God. Every path has its destination. None should be surprised at the end of the day. There is the path not right with God, which also has no business with the right destination. Everyone needs to know that the rightness of the just includes the rightness of his path. It is the man, right with God (relationship) who is also on the right path as taught or prescribed by God (existence) that will use the blessing of shinning like the sun to get to the zenith of God’s plan for his life. The father (relationship) who sent me is with me: the Father has not left me alone; for I do always those things that please Him (existence) – Jesus Christ (Jn 9:28). The emphasis in the text is the right journey by the right person. Someone right with God can not find useful a wrong path. That is either foolishness or presumption. The prosperity of the wrong path is fleeting. David described it as being set in slippery places. The end of it cannot be the zenith defined by God. When the path of a man pleases the Lord, He causes the path to shine like the sun that aims for its midday zenith. When the way of a man is right with God, He causes the man’s path to shine or progress towards its zenith. We become right with Him by faith. Faith agrees with God over what has been revealed and the same faith, if does not flag or waiver, travels with God to the zenith of the plan that the glory might be to God who makes all things beautiful in its time. Preparation is a process of change, and not the same as waiting in the sense of being stuck. God’s plan is for your path to shine like sun towards its zenith (Pro 4:18). Get yourself and your loved ones ready for this event. REGISTER NOW AT http://hgr2.eventbrite.com/ Registration is required for everyone from 18 and above. The church is living in its traditional rut and is indecisive about resolving the obvious generational gap if all the answer it can provide to the issue is about what needs to be protected than how to effectively reach the younger ones. While tradition can seriously cloud judgement and innovation, it is a responsibility to march with the unchanging truth from generation to generation. The defence of truth is not a protection of it. Truth is objective and needs no protection. Our apologetical efforts are simply affirmative propagation of the reliable and credible truth. Human traditions that changes with time, whether you like it or not, is what the church busies itself with protecting. Give the unalloyed truth to the upcoming generation and it would set them free. From generation to generation, truth will always work. The World Reaps What It Sows. Billy Graham’s daughter was interviewed on the Early Show and Jane Clayson asked her “How could God let something like this happen?” (regarding the attacks on Sept. 11). Anne Graham gave an extremely profound and insightful response. In light of recent events…terrorists attacks, school shootings, etc. I think it started when Madeleine Murray O’Hare (she was murdered, her body found recently) complained she didn’t want prayer in our schools, and we said OK.